Exclude Filters will prevent a message from being sent when the health alert contains the specific text that you define. This is useful if you regularly get notified about a health alert and you wish to no longer receive messages when these notifications are issued. 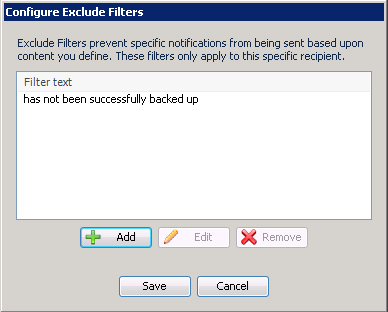 For example, if you wish to never receive notifications when a client computer has not been backed up, you could create an Exclude filter with the text “has not been successfully backed up”. Exclude filters are configured per-recipient and are not case sensitive, for example “antivirus” is the same as “AntiVirus”.